Fifteen-two, fifteen-four, fifteen-six, fifteen-eight, double-run, sixteen and one for the jack, is a typical way to chant and to count a Cribbage hand. It’s not just the way in which we rhyme-off the points, it’s the joy with which we count them, as we lay down our open hands with pride, almost like the conqueror of a continent. As if counting the cards aloud came naturally to us, as natural as moving the steeplechase-like pegs forward on the board. 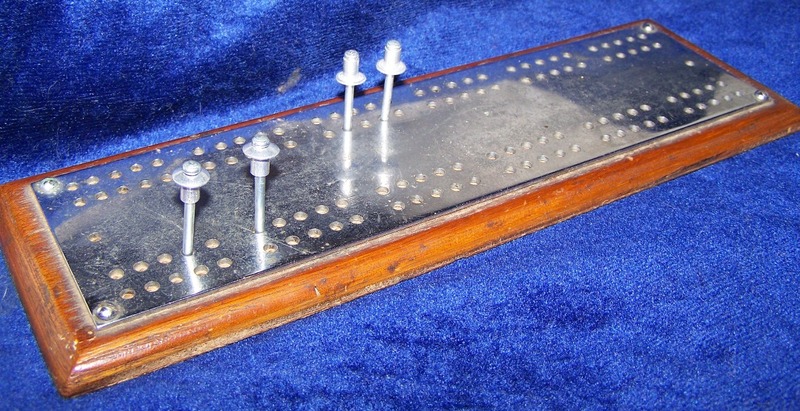 Without realizing it, we play Cribbage today as a regular card game, yet not so long ago playing Cribbage and other card games were once at the very core of our own social networks. Connecting us to the people and places within our small communities with a simple deal of the cards, sitting directly across from our fellow neighbours. There is an excitement in the air, when playing with real people in today’s local tournaments. You can still see it in their eyes and hear it in their voices, as each player proudly shouts out their high-hand, in a voice they had as a child, and a smile from ear to ear to match. Gaining popularity in the 1930’s, Card-playing "nights" at our local clubs, churches and halls were proudly advertized throughout our newspapers (including the Verdun Guardian) and some across the airwaves of our earliest radio stations. Card games were once the common thread that we all shared with each other within our own towns, across our island communities, and in a global sense, across the civilized world at that time. In addition to Cribbage, many other games such as Whist, Bridge, and Euchre, and their variations, were also very popular during these weekly "Card night" events. They were truly social events, with refreshments served, prizes given out, and many other fun activities to accompany the jacks, queens, kings, and aces played out through the night. These evenings did not just provide entertainment, as they also raised funds to keep these clubs, halls, and social events afloat, by relying solely on their popularity and on their ability to give the people what they wanted, an exciting chance to socialize. Social networking was very different then, as people were provided the opportunity to form friendships from on-the-spot conversations with real people, from their very own corner of town. Your conversational abilities and your proper use of manners had to be at their best, as your words could not hide nor could your actions be retracted, as we can behind today’s computer screens. First impressions carried the night and usually lingered beyond. Card nights were only one of the many social activities that allowed us to mingle. Town picnics, a variety of hobby, sports, and fishing clubs, all allowed us to meet and bond with the many people within our own communities, in a time without television or internet. Card games were not only for adults and were carried from parent to child. Parents knew that they were teaching their children to use their intelligence, tact, and reasoning skills, whether they were playing Crazy-8’s, Rummy, or a simple match game, all under the guise of "play". Many card games continue to provide this early-level learning to our children, including the clear advantage it gives them in mathematics. Although, today’s electronic toys may have all the bells and whistles, a deck of fifty-two cards still offers an endless variation of possibilities, not only to use our intelligence but also our limitless imaginations, to keep us entertained while learning. So bring out those old cards, crib boards, and bridge chairs, to have a "social" of your own. Or better yet, attend a local card night, where you are still guaranteed a great time and a smile, before the fine art of card-playing pegs-out for good…throughout our once very social Southwest Corners.